This up market resort is known for its spectacular scenery and the 5 star hotels. 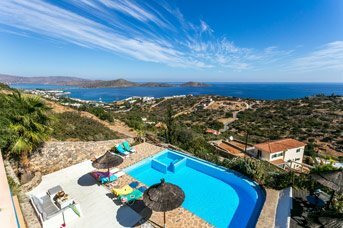 There are small and pretty beaches and the famous island of Spinalonga is a short boat ride away.This up market resort is known for its spectacular scenery and the 5 star hotels. There are small and pretty beaches and the famous island of Spinalonga is a short boat ride away. Lots of people come to Elounda to visit the island of Spinalonga. This tiny island has been made into a TV series as well as a novel by Victoria Hislop. Take a small boat from the tiny village of Plaka or for a little longer trip, the harbour in Elounda and visit the island. The centre of Elounda has a selection of mini markets that stock all the day to day necessities. 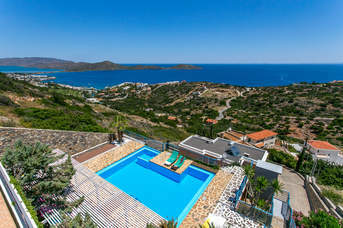 There is a wide selection of bars and tavernas in Elounda to that suit all tastes. The harbour at Agios Nikolaos has some waterfront restaurants where you can enjoy anything from a light bite to a more traditional Greek Meze. There are a number of small beaches which can be accessed via public paths that run through hotel grounds. 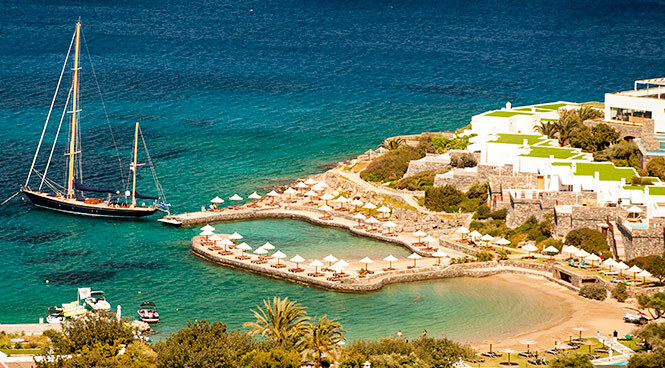 The beach in Elounda is a man-made sandy beach which has nearby cafes and tavernas.